WELCOME TO THE KAYAK RENTAL PRE-TRIP INFORMATION PAGE! Please Note: denotes that you must review this information prior to your departure. There are several places that you can get Travel Medical / Evacuation Insurance, including your automobile club (AAA or CAA). You may even have some form of these policies included with your credit card, please look closely at your credit card details for this information. Download the Essential Information Package to properly prepare for your travels to Belize. This package includes your arrival logistics, trip packing list, tips for conditioning, extra information on fishing background material on the country, etc. Optional: Along with the Essential Information package, we also include a number of interesting articles which will give you some additional background and understanding of the area in which you are about to visit. The appendix to the Essential Information package can be accessed, below. Each person in your group will need to fill-out the Travel Information & Medical Form + Release of Liability & Waiver Form prior to your final payment, or making your internal flight arrangements. 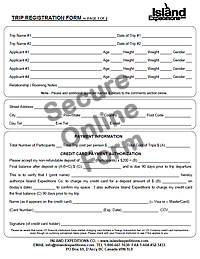 With this form, we gather information on your International Travel Arrangements, Medical or Dietary Issues, and also get you to sign the Release of Liability Waiver Form. 1) Click on the image below to be taken to our secure online Travel Information & Medical Form + Release of Liability & Waiver in a new browser window or tab. 2) In the form, please enter your first and last name plus your email address to start the e-signature process. Note: Our online form is hosted with E-Sign Genie, a company that specializes in secure online documents. Please call us at 1-800-667-1630 with any questions or concerns. 1) Click on the link to open a PDF version of our Travel Information & Medical Form + Release of Liability & Waiver. 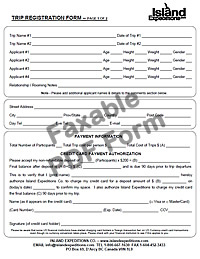 2) Print the document, fill in the details, sign it, and fax it to us at 1-604-894-2314. PLEASE READ: The above form is to be opened on your computer, information filled in, and printed off, so you can manually sign the document. Please fax the completed document to our office at 1-604-894-2314. Please download the Emergency Contact information and print off two copies. Please carry one with you and leave one version at home with family or friends, so they can contact you in case of an emergency. (Please Note: This form is for your reference, and is not to be returned to our office.) The Emergency Contact form can be accessed, below.